Analyze and explore the fundamental principles related to interior acoustic design, and their relationship to green buildings and sustainable design. Examine the traditional and new ceiling system options available to provide interior acoustic treatments that are both visually appealing as well as acoustically appropriate to the space use. 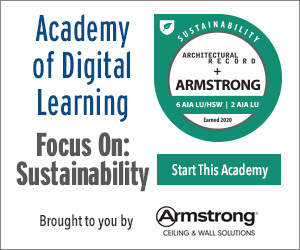 Assess the various characteristics of acoustical ceilings that can contribute to green and sustainable building design. As architects and designers, we are all aware that people experience a building with our human senses. While designs often pay the most attention to what we see, our sense of hearing is also directly impacted as soon as someone or something makes a sound in a building. If the quality of sound is not a factor considered in a design, then it can result in poor acoustic quality, distracting noise, or an irritating experience. Poor architectural acoustics can be annoying or distracting such that it can impede concentration, comprehension, healing, or learning. By contrast, good sound qualities can add drama, vibrancy, and energy, creating a useful, inspiring, and helpful experience. Overall, when visually appealing spaces and acoustically appropriate techniques come together, the end result is a fully successful building design. To achieve this positive balance of visual and acoustical performance, architects and designers have more material and system options than ever to choose from. This is particularly true when it comes to ceilings which have long been used for acoustic control in buildings of all types. Understanding the full range of options currently available from manufacturers allows design professionals to create ceilings that perform well acoustically, add to the visual aesthetics, and contribute to sustainable designs. Acoustics is the scientific study of sound in all its forms, and architectural acoustics is specifically related to the interactions of sound both within and between architectural spaces. Professionals, specialists, and scientists have studied sound in terms of its generation, its transmission through space and objects, and its reception by people. In all cases, sound radiates outwards from the source, of which there are many, both inside and outside of buildings. 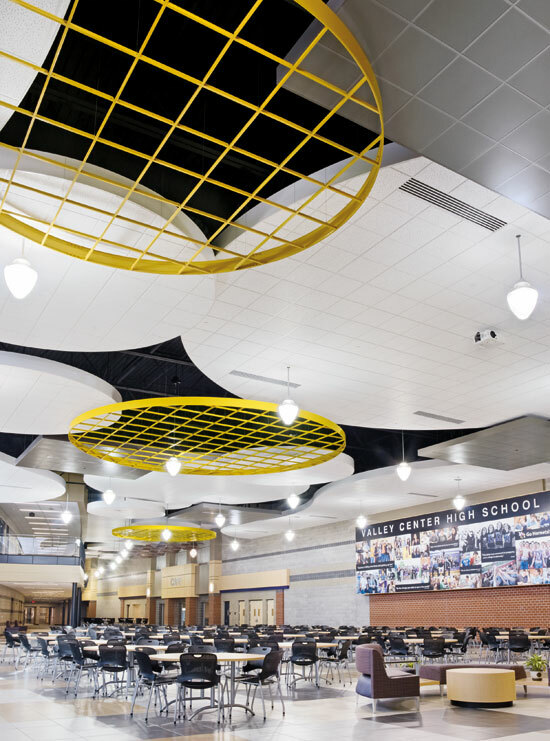 Architects and designers can control the visual appearance of ceilings and achieve excellent acoustic performance by understanding the many options available.